A fearsome broadsword from ancient China, the Dao is a blade that finds its home amongst martial artists and daring warriors. The LARP Jade Dao - 100cm is a blade truly fit for master fighters and heroes of legendary tales! This Chinese LARP sword features a slightly curved blade that is made from closed cell foam and encases a fiberglass core. The broad point of the blade is strengthened by a Kevlar tip that covers the flexible core, ensuring that no accidental punctures or tears occur. The hilt of this LARP broadsword is where the weapon gets its name, as the swirling patterns that decorate it have been painted jade green. The guard features an antiqued brass color while the ring-shaped pommel is made to look like iron. 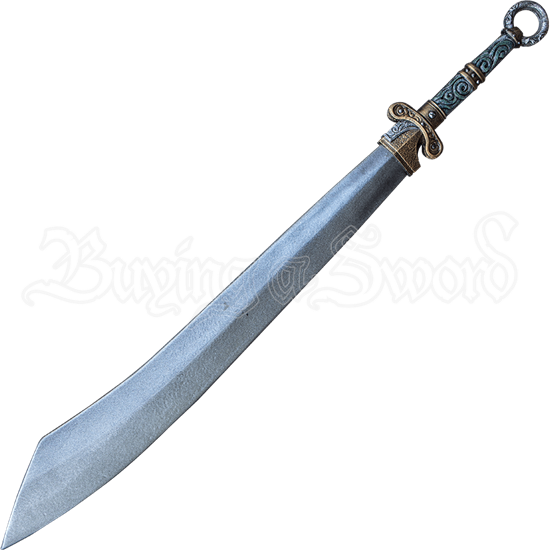 Add this graceful weapon to your LARP arsenal and demonstrate your mastery of the combat arts! The LARP Jade Dao - 100cm has an overall length of 39.4 inches. Please be aware that this measurement can vary slightly, as it is a hand-made item.